Thumbnails are small quick sketches. These sketches aren’t to record details, forms or depth they are for planning out the elements of your compositions and designs. Just like before building a house or writing a book you need a planning stage. For artist this planning stage takes the form of thumbnail sketches. These need to be done quickly so we can move onto execution of our painting or drawing. 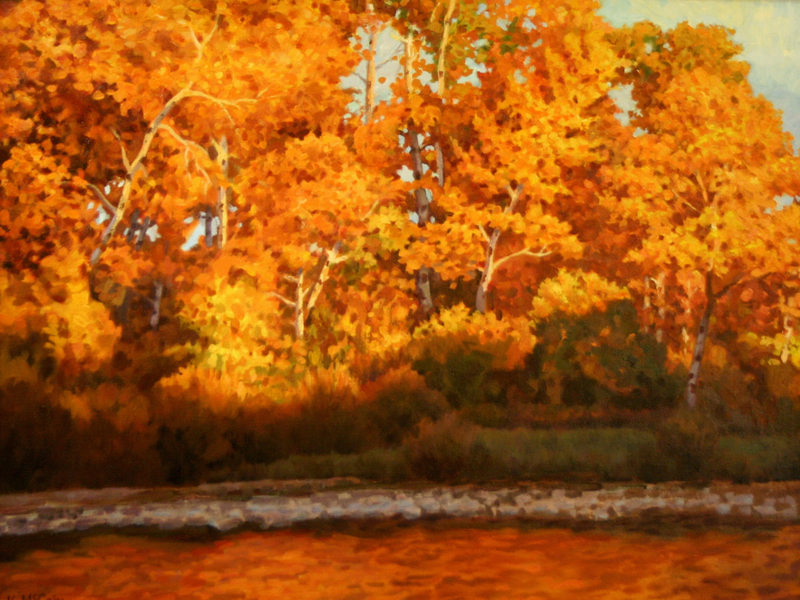 We you are outside painting or drawing landscapes this can be especially important, because the light changes so quickly. Thumbnails are very primitive. They contain only the most fundamental information about our subject. They could even be a basic as squares, ovals, triangles just enough so we know what these shapes represent. 1. Analogous – Where the vertical and horizontal movements or lines are used. 3. Symmetrical – Where the main shapes are of similar size on either side of the picture plane. 4. Asymmetrical – Where the main shapes are of very different sizes. Such as Large shapes on one side smaller on the other. By making these decisions on how to design your art you will have stronger and more interesting artworks. Below I have included the four examples of Design. These drawings are very simple but more importantly they tell me how I am going to approach the drawing or painting. Next time before you start on your drawing or painting start by using thumbnails to plan things out do 4 or 5 and pick out your favorite. Then do it! You will enjoy your results even more by creating a plan. By popular demand I am including another 5 ways to improve your drawing. 1. Loosen Up- Drawing shouldn’t be stiff, it should be “controlled” when starting out the differences can seem like double talk but it’s not. Try holding your pencil further towards the back and using your whole arm, elbow or wrist. You will be looser with your marks you have to be, also try keeping your hand off the paper. These two things will help you to “loosen Up”. Also don’t be afraid to try several times to get the line right. It can seem strange but you’ll have a better chance of finding the right line. It’s a little like winning a raffle the more tickets you have the better your chance of winning. 2. Look for Basic Shapes- I am sure everyone who has taken my drawing is rolling their eyes at this one. I know I mention it time and time again. Because it’s that important, every time I am having a problem with my drawing I always start by reassessing the basic shapes and observing the objects to see if the basic shape relationships are accurate. We are very adept at seeing shapes and everything can be simplified into basic shapes, squares, rectangles, triangles, cones, cylinders and spheres. It is effective approach and it will help you every time you simplify things into basic shapes. 3. Have Definite Areas of Light, Medium and Dark Values- Value is such a powerful tool but sometimes it is hard to create and control. Whenever you have a drawing that seems to lack any visual impact ask yourself if the drawing has a full range of values. 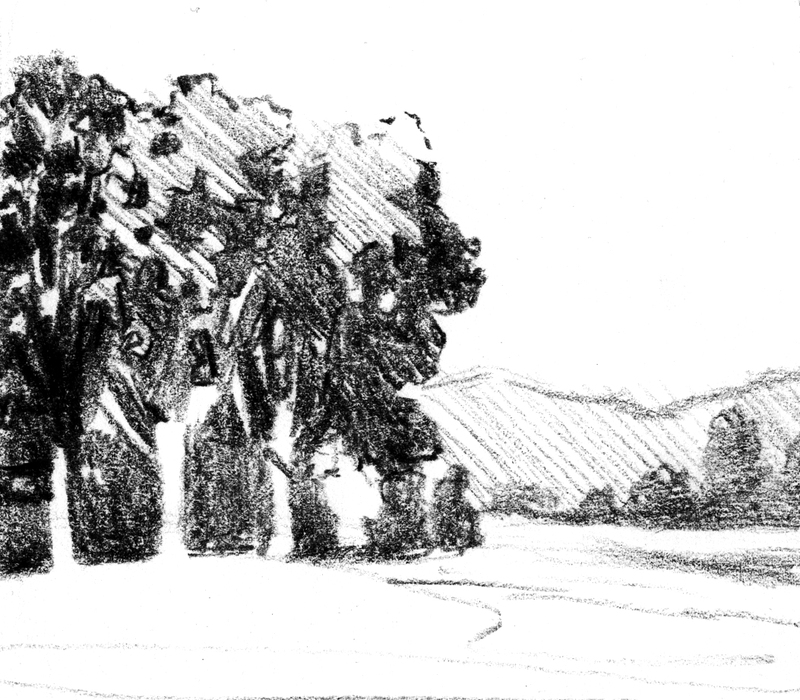 Every drawing should have definite areas of dark values, middle values and light values. If not it will look flat. Every individual object should also have definite areas or planes of dark medium and light. By increasing the range of values your drawings will be much more powerful. 4. Ignore the Details- Too many times we are fooled or distracted by details. As a beginner it’s hard not to focus on details entirely. It’s tempting to jump in and try to render every last detail with absolute fervor. Unfortunately if you try to work this way you will end getting lost in the details and end up with a poor drawing. The reason is you missed the “big picture”. This doesn’t mean to not include details it means in the beginning look to the “Big Picture”. You do that by sticking to the basics which always starts with the shadowing of an object. For example: If I was drawing a tennis ball I would start with a sphere that was properly shaded with all the “form shadows” in place. Once I had done that I would begin to add the details. The details have to conform to the “form shadows” of the object. After you have you basic shading you can begin to hint at details instead of trying to draw every single fuzzy on the tennis ball. Working this way will give an amazingly convincing drawing. Ignoring the details at the start of a drawing is one of the most important concepts in drawing! 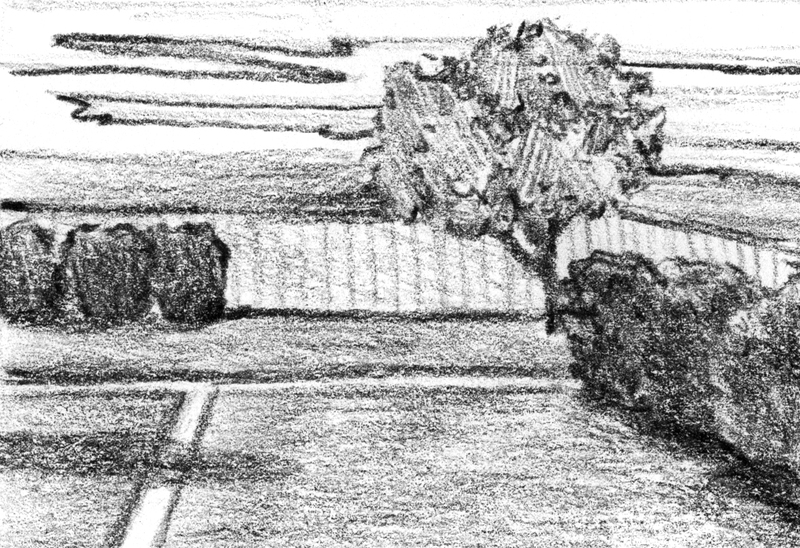 Take landscape drawing as an example. 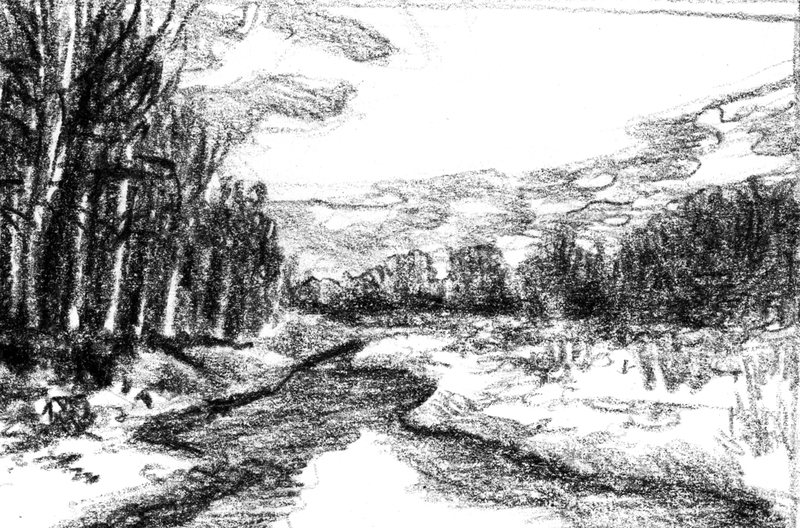 Even the most detailed of landscape drawings have left out tons of details. There just isn’t enough time in 6 months to add every detail to a landscape drawing. Instead artists focus on shapes and “form shadows” to describe their landscape. The same thing applies to whatever you draw. Look below at the drawing. It is very clear and has implied details but it is more about the shading than the minute details. 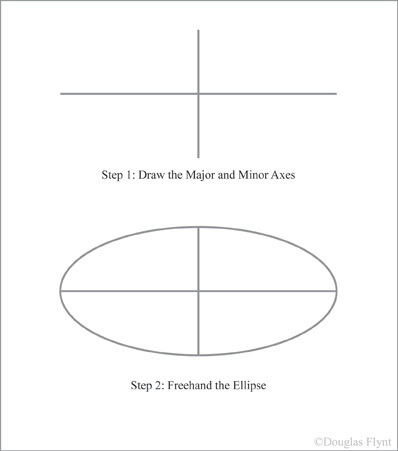 5: Learn to Deal with Ellipses- Ellipses, which is a circle foreshortened in perspective, are some of the hardest things for a beginner and even an experienced artist. Here are a couple of things to remember. When drawing ovals. 1. No matter how tight or pinched the oval is the ends should be rounded not pointed. 2. Use a rule or straight edge to make sure the oval is lined up corner to corner. 3. Use a line through the center of the oval to help yourself as you draw an oval. Use these three tips to practice, practice and practice some more. When you are starting out with anything there is a learning curve. There are common mistakes that all beginners make that can slow down your progress with drawing. Don’t worry everyone makes these mistakes the important thing is to break these tendencies so your drawings will improve. When you are using your pencils be careful not to use too much pressure. If you push too hard you will destroy the texture of the paper. This will be very noticeable in your drawing. It also makes it more difficult to control your drawing if you want to modify the area where the texture has been destroyed. To preserve the texture of the paper use light pressure. No more pressure than you would use with a stylus on the surface of a smart phone. If you use less pressure and take more time building up your values you will have more control over your drawing in general. It takes time with graphite to establish rich darks (not a challenge with charcoal). Learning to see and increase the value range in your drawing will help your drawings have more visual impact and more depth. Sometimes fear of going too dark can keep us from establishing rich values. However if you use a light touch and know how to use your erasers this will not be a problem. Nothing will kill the depth in a drawing quicker than outlining everything. If you use hard lines to outline everything, you will destroy the illusion depth. There are times when you use lines to create value for reasons of style such as cross hatching, but as a beginner we usually rely on outlines instead of value to separate and define objects. Look instead for “edges”. Edges are created by the value of a particular shape in context to another shape. 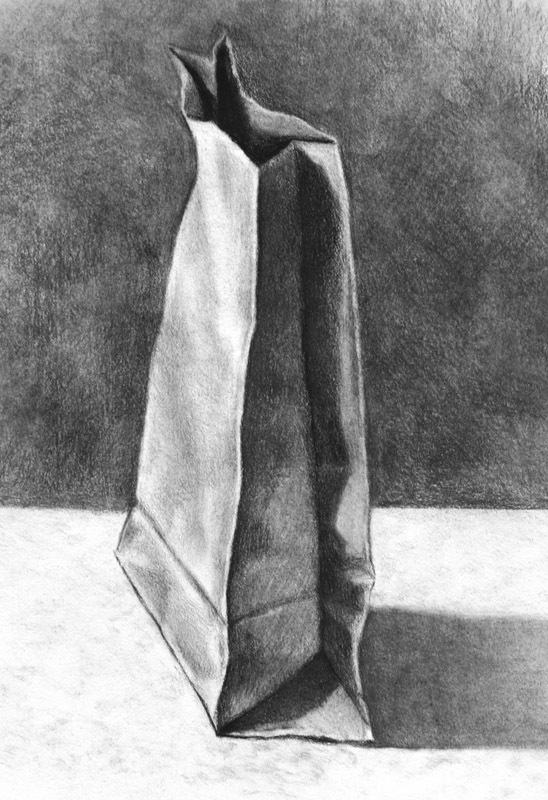 Example of the outside of the bag where it touches the darker shadow shape of the wall creates the edge of the bag in the drawing. To preserve the life of your drawing be sure to use papers that are 100% cotton rag. Most of these types of papers will be watercolor and printmaking papers. I prefer 90lb to 140lb papers. Papers come in different textures and are sized differently. (Sized means how absorbent or non absorbent the paper fibers are. Gelatin sizing is used to control paper absorbency). Paper textures vary, starting with plate (smoothest), hot pressed (slight texture), rough (more texture), cold pressed (most texture). I prefer using paper with at least a slight texture. I use papers with different sizing, depending on the need. Heavily sized paper is easier for tight rending and using hard erasers without destroying the paper. Heavy sized papers like Arches hot pressed watercolor paper or Strathmore illustration board are great for pencil drawing and tight renderings. 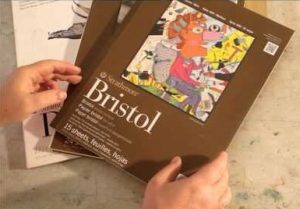 Lightly sized papers have a more delicate surface, so the drawing done on them have softer marks and the media you use will penetrate the paper more. 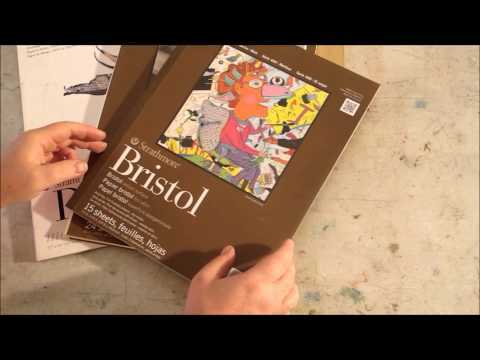 I use lightly sized papers for pastel or charcoal drawings. 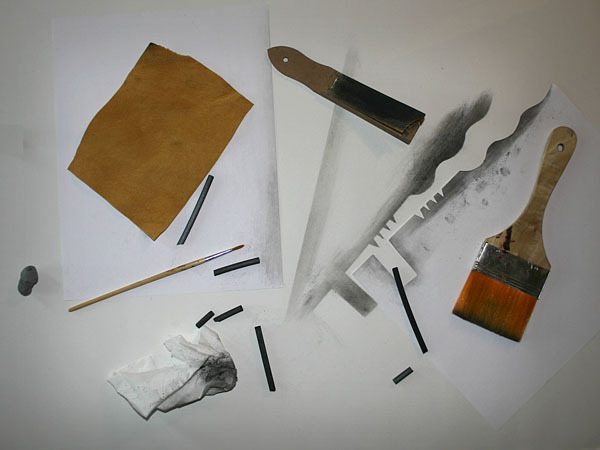 Lightly sized, more absorbent papers I like using with charcoal, like Rives BFK, allow for smearing and smudging techniques that give you soft values. These papers all have great qualities for different techniques and approaches. Find the texture and size of the paper that pleases your taste and suits your purpose.